Der Europan10 Wettbewerb lässt mich nicht los. Heute möchte ich den Wettbewerbsbeitrag von Eriksen Skajaa Architects, einem kleinen Architekturbüro von Arild Eriksen und Joakim Skajaa vorstellen. Mit dem Beitrag „Shuffle“ haben Sie in Norwegen, Oslo den ersten Preis gewonnen. Das Projekt untersucht low rise/high density Stadtplanung als eine Möglichkeit, die lokale Identität zu stärken. Dabei werden Passivhaus-Konzepte eingesetzt um die Gebäude zu gestalten. Die weiteren Informationen sind von den Architekten selber und unübersetzt in Englisch. The forested paths on Haugerud are places of natural beauty and create a strong sense of place and identity. 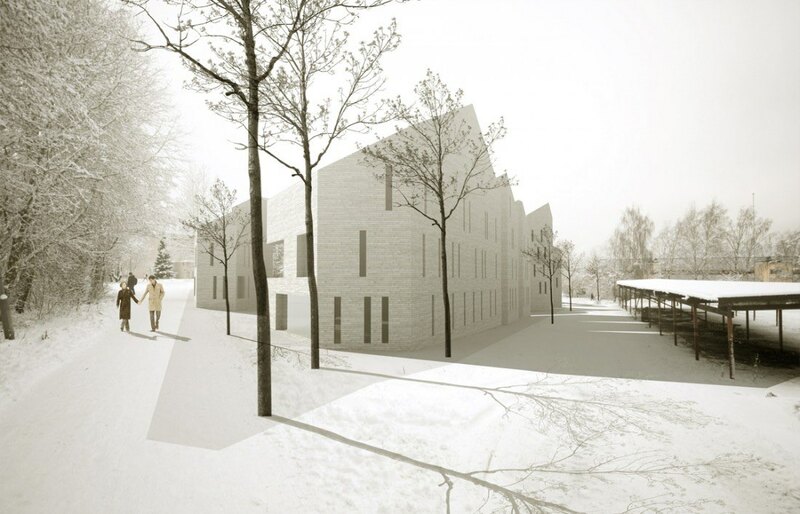 We propose to extend the network of forested paths through the study area to facilitate interconnections and permeability; both through the new development and through existing homogenous strips like the school area or the social housing. We propose to shuffle the existing program in the study area to enhance the life in the area and intensify the utilization of space. Low quality space will be upgraded through this strategy. Examples could be the colonisation of garden allotments, sports programs found in the middle of housing areas and an activity center in the new development shared by the school. Penetrating these boundaries is an important step in the groundwork for a new identity. Flip is a strategy for turning the buildings in the area towards the public space. The school buildings and the centre all turn their back on the public space. By creating public spaces we also want to give them a clear direction. In our proposal we remove most of the existing centre and make facades that open up towards the new public space. Some key points in the study area will be used for more specific program to create specila points of interest. The metro station is already one such point and will be given an upgrade and modern bike parking facilities. The high rise building will be converted into a health/ wellness centre. Public activity centres will be points of special interest to the young and old people that spend time in the area. Inventing urbanity. Ecology versus intensity. We propose a new development on the site based on sustainable ecological principles and the need for a semi -urban typology that can cater to the dual need of new housing typologies (young/ elderly/ small families) and a restructuring of the local retail economy. Grid orientation, formal characteristics, facades and construction methods where determined by the passive house standard. The shaping of the volumes brings light in between the streets and to the solar facades, but it also gives houses individual character. Through this process we have developed a clear urban typology consisting of a relatively small scale urban unit that is combined in a dense configuration. The unit can accommodate both the existing and proposed programs such as health and recreations centers. There is flexibility within the modules to develop a wide range of housing solutions ranging from individual houses to blocks of flats. The ground floors have all been made as flexible as possible so that they can shift between housing and retail functions. Through a high degree of fragmentation we open up possibilities that the large scale existing structures can’t cater to. We foresee in the beginning that a few small scale shops could function in the area, but we also see that this can be the framework for a development where retail and recreation colonise the entire development. This is the concept we call shuffle. Another possible outcome is that the area becomes more a housing area and that people continue to do their shopping in the neighboring areas. We create flexibility within the framework of a strong urban typology. Urban intensity in this context means not so much an extreme number of people on a small lot, it means living and working in close proximity to each other and shared public space. Larger types of public space such as school yards, fields, football pitches and parking lots are abundant in the area, so we have deliberately tried to make the public spaces small enough to generate types of proximity that will be an addition to the whole area. As permeability is a strategy of the project we will add smaller volumes to create a town or Medina with buildings that can easily fit into the fabric with another program. We believe the feeling of the small scale village will strengthen the identity of Haugerud, as well as offering an attraction.